Its been pretty busy around here. I've been sewing like a mad woman and we've been doing a little remodeling, too, so there's not been much time to spend writing. I've been asked which dresses I'm considering for the wedding, so here's a brief rundown on what I'm looking at. Last night I finished up the third dress -- Simplicity 2917 and the night before, McCalls 5061. Once I get my 5 dresses completed, I'll decide which dress to make for the big event and cut into my pretty silks. 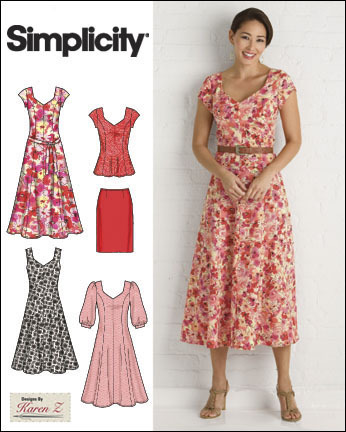 On deck are Simplicity 2947 and Burda 7666. I've got the jacket of Burda 7666 cut out of a lightweight linen that I'm hoping to get to next week. I'm really a little nervous about it because I've not made a jacket in decades, and then it didn't go all that well. I've learned alot since then, though, so maybe it won't be so bad.....we'll see. The worse case scenario is I'll have a dress and no jacket....no big deal. Good luck with your sewing and remodeling! Thanks ;) We're enclosing our back porch and putting down floor tiles. I looks pretty nice so far. Next is grouting the tiles before the carpenters get here to trim out the windows next week. I'm really hoping to get the ole' rocker out there again soon. It'll be sooo nice. Happy sewing!! and remodeling!! Hhehhe.. I enjoyed looking at the dresses. Be sure to post which you decide on!